does it support microsoft word and powerpoint? please reply. ART CRUZ, 12 Oct 2012Hey, tab2 7.0 also usea powervr not mali400, fyi... We all know that samsung release this t... moreBro..read carefully " for graphic, it uses PowerVR SGX540 instead of mali 400 in tab 7.0 plus. FYI, mali 400 still being used in the latest note 2" i was talking about tab 2 7.0 first, then only i talked about 7.0+. Then i talked about note 2 is still using mali 400 means mali 400 is still a great gpu n NOT powerVR SGX540.. If u have 7.0+ & tab 2 7.0, try to take picture. Which one is better? Just keep it to your self, not to mention if taking picture in no light or low light which 1 is better. Pricing wise, frankly speaking, i am not a cheapo so i dont mind paying extra 20% if i can take a better picture, faster cpu speed and a great gpu. Last advice..read carefully & understand before u misunderstand something..
MUBASHIR, 09 Oct 2012iam using tab 2 since from last 2 months i purchased price of 18700 in hyderabad. its awesome ... moreHow to update this tab to ICS 4.0.4??? AnonD-23619, 12 Oct 2012how is its battery backup. how much time it can spend while playing media?It depends on your settings like display, if normal display like set to auto. i think around 7-8hrs. ART CRUZ, 12 Oct 2012Hey, tab2 7.0 also usea powervr not mali400, fyi... We all know that samsung release this t... moreBro..read carefully " for graphic, it uses PowerVR SGX540 instead of mali 400 in tab 7.0 plus. FYI, mali 400 still being used in the latest note 2" u read and misunderstood what wrote. Anyway..the difference is so much in philipines? In malaysia its just al little. Tab 7.0+ is rm1350 & tab 2 7.0 is rm1200. Unfortunately since the launch of tab 2 7.0, tab 7.0+ is no longer being sold. Thats y i said i am lucky to have 7.0+. That is after i upgrade to ics, before that it was just ok...after upgrade the performance is superb! Wait till jelly bean update.. It will come to tab 7.0+ & tab 2 7.0 sooner or later. JP, 12 Oct 2012How is the portability of this tab .... I am undecided as to weather to go for the 7 inch or 1... more7inches is better for complete features to use. Which is very handy for executive & businessmen. how is its battery backup. how much time it can spend while playing media? When is the official JB update coming on this?? If I get it from US, will it work with Indian sim cards? 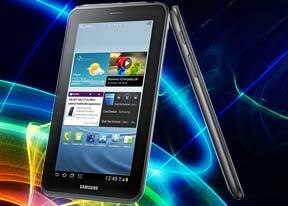 We all know that samsung release this tab for cheap and affordable tablet with still superb chipset and graphics card. 7.0 plus is a good phablet especially on display, BUT with much expensive. Here in the philipppines, 7.0 cost 15-17k PESOS while 7.0 PLUS cost around 24-26k Pesos! i am a tab 7.0 plus user and felt lucky to have 7.0 plus instead of tab 2 7.0. it's because tab 2 7.0 are lack of some features available from it's predecessor. tab 2 7.0 processor has been downgraded to 1 ghz, so processing power is little slower if compared to tab 7.0 plus. for graphic, it uses PowerVR SGX540 instead of mali 400 in tab 7.0 plus. FYI, mali 400 still being used in the latest note 2. camera is lack of autofocus, so taking picture with tab 2 7.0 is not as clear as tab 7.0 plus. in terms of software, after i upgraded my tab 7.0 plus with ICS, it performs better from tab 2 7.0 plus. this is also applies to tab 2 10.1. i am a proud user of tab 7.0 plus. bala, 11 Oct 2012Can i use any SIM Card like reliance, airtel and others to make call?Yes 99.9% possible with any normal size SIM. After all, P3100 is simply a bigger screen smartpone like gn/gnII.